Audi wasn’t a big producer of convertible cars until the 80 based Audi Cabriolet of the 1990s. This car sold in fairly small numbers until it shot to fame as the regular transport of Princess Diana. She and her Audi convertible were regularly in the pages of newspapers and magazines as she travelled around London. The publicity was priceless for Audi and sales rocketed. This car was followed by the Audi A4 Cabriolet (and later the Audi A5 Cabriolet) along with the TT Roadster and A3 Cabriolet as the convertible car market boomed. The A4 Cabrio sold just as well as the earlier car and boasted better refinement, space and equipment. Most recently the Spyder version of the R8 super car rounded off the Audi convertible range. 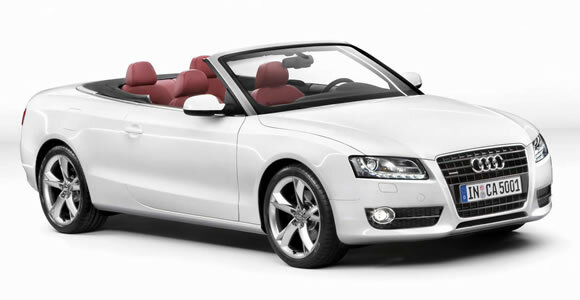 Audi’s attention to quality is particularly clear in their convertible cars with a range of well insulated fabric roofs. The brand has a notable absence of a hardtop convertible in their range of premium cars choosing to prefer the extra luggage space, style and simplicity of the fabric folding roof.